BANGI, 18 Oct 2013 – The National University of Malaysia (UKM) has been selected as the secretariat to determine the design and architectural identity of the country by the Board of Architects Malaysia (LAM). A Memorandum of Understanding (MoU) to the effect was signed by both institutions here today. 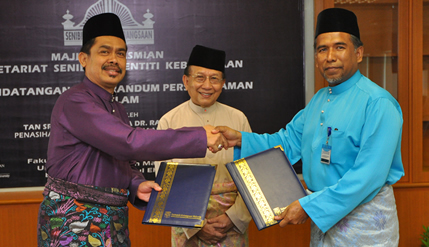 Deputy Vice-Chancellor (Students and Alumni Affairs), Prof Dato’ Dr Ir Othman A Karim signed for UKM with Ar Prof Dr Amer Hamzah signing for LAM as its President. The Faculty of Engineering and Built Environment (FKAB) has been assigned to be the Secretariat as a resource centre of building design and architecture that is distinctively Malaysian. The signing ceremony was witnessed by the government’s advisor on socio-cultural affairs Tan Sri Dato’ Seri Utama Dr Rais Yatim. Tan Sri Dr Rais said he would propose to the cabinet to implement policies on designing buildings with the Malaysian heritage in mind. Prof Amer said UKM was chosen because FKAB had proven its ability to design sustainable structures and forms which reflected local values​​. The LAM President said the secretariat to be established will act as an entity to empower national identity. The secretariat will also form a framework and provide resources on the design to be implemented by both the government and the private sector to form the basis of the national identity architecture. It is also expected to help preserve the heritage of national architecture and built environment. Efforts to formulate a national architecture policy began in 2009 when the cabinet decided that all new buildings should be built reflecting the Malaysian identity. Following that, LAM provided the architectural basis, taking into account the proposal by the Malaysian Institute of Architects (PAM) titled The Case for theFormulation of the Malaysian Architectural Policy and working papers produced by the Ministry of Housing and Local Government.